Congratulations to CTI’s 2014 CTI Fellows! We were thrilled to honor 98 CMS teachers for their outstanding work in 2014 CTI seminars at CTI’s Fellows’ Finale celebration Dec. 11 at the Bechtler Museum of Modern Art. 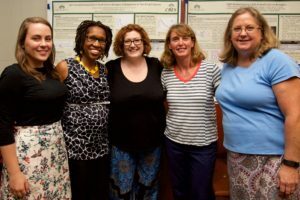 This year’s CTI Fellows include 35 elementary, 27 middle and 36 high school teachers, representing 45 CMS schools and a wide range of content areas from science, math and technology to history, social studies, English, languages, music, art and more. For fun facts, consider this: together they have taught for 986 years and plan on teaching 1,532 more; together they will teach 15,144 students during the next 12 months. CTI Fellows were saluted by Bechtler Museum of Modern Art Director John Boyer and CMS Acting Superintendent Ann Clark during the festivities. Clark heralded CTI as “absolutely the beacon opportunity for teachers.” The texts of their comments are available on the CTI website. New curriculum units created by CTI Fellows will be posted on the CTI website in February. This was CTI’s sixth annual cohort of CTI Fellows. To date CTI has offered a total of 44 long-term professional development seminars for 313 CMS teachers, with 40 CTI National Fellows also participating in seminars at Yale University. Posted on December 19, 2014 by Robin Mara. This entry was posted in CTI News, News. Bookmark the permalink.